Tulips (Tulipa spp.) thrive in U.S. Department of Agriculture plant hardiness zones 3 through 8, where their vibrant blossoms add color to backyards during March, April and May. Come June, you don't have to kiss thee colorful tulips goodbye. Carefully dry each delicate blossom, and you can keep tulips in a vase all year. Tulips come in a rainbow of vibrant hues. Success at drying tulip flowers starts with picking the right blossoms at the right time. Cut fresh tulip flowers right before they reach their peak and before they're opened fully. You don't want young, immature blossoms, nor do you want flowers that have been open for a while and are about to start wilting. The sweet spot is right in the middle. Head out in the morning before the day has heated up. This is when each flower is its crispest and strongest. Wipe down a pair of garden shears with rubbing alcohol -- this prevents the spread of plant diseases -- and snip off a flower, leaving a couple inches of stem attached. Everyone has a favorite method of drying flowers, depending on how much time they want to invest. Air drying is the easiest option, but delicate tulips often lose their color and shape when dehydrated this way. Sand drying overcomes such problems. The blossom keeps more of its color and the sand helps to support the flower so it doesn't lose its shape. Pour half an inch of fine, white sand into a sturdy box, such as a shoebox. Place the cut tulip flower on the sand. Fill the rest of the box with sand, pouring gently so the rush of sand doesn't smash the flower. Cover the box and set it aside in a warm, dry spot for two weeks. Chemical drying works similar to sand dryer, but the moisture gets sucked out of the tulip faster. 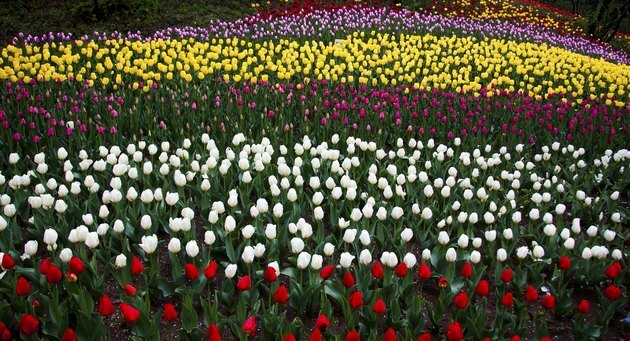 For a delicate flower like a tulip, this can result in a better shape and richer, brighter colors. Use a shoebox, just like you would with the sand method. Mix equal parts of borax with fine sand or cornmeal. Pour a 1/2-inch-thick layer of the drying mixture into the bottom of the box, place the tulip on the drying mix and fill the rest of the box with the drying mix. After a couple of weeks, you'll have a dried, preserved tulip. Microwaves aren't just for quickly heating up leftover food: They are one of the best options to preserve tulips and other blossoms that have thin, fragile petals. You'll need silica gel crystals -- available at craft supply stores -- and a microwave-safe container large enough to hold the cut tulip. Make sure it doesn't touch the sides of the container. Unlike with the other methods of drying tulips, pick fresh tulips destined for the microwave in the afternoon when blossoms are the most dry. Pour an inch of the gel into the container, place the flower on the gel and fill the container with gel to completely cover the tulip. Microwave on high for three minutes, and set the container aside in a cool, dry place for 24 hours. Brush away the silica crystals to reveal the preserved flower.